#LivingYourBestLife is now even easier thanks to Snap Accelerator Senior Designer, Carlos Estrada ‘08. 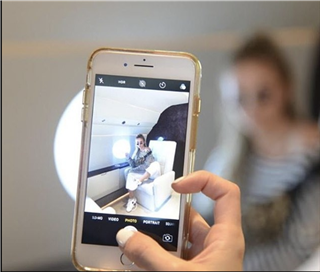 In one of his most recent projects, Carlos and Snapchat teamed up with Matty Mo aka The Most Famous Artist and SelfieCircus to install and launch The Private Jet Experience, which recently debuted at Fred Segal in the Los Angeles and Art Basel 2018 in Miami. Wanting to democratize the jet set selfie, Matty created a backdrop complete with leather seats and small jet windows so anyone can snap a luxe selfie. Using his natural creativity the expertise gained from his tenure at Snap, Inc., a technology and camera company best known for its development of the popular app, Snapchat, Carlos and his team took Matty’s idea from single-store installation to viral sensation. After graduating from Savannah College of Art and Design in 2012, Carlos began his career in product development but quickly shifted to pursuing more branding roles. 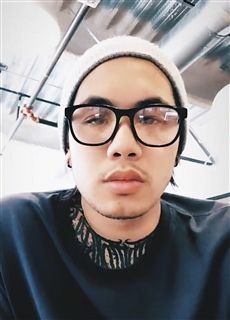 Throughout the course of his career, Carlos has worked on branding campaigns for Samsung, Burton, New Balance, Fossil, and celebrities, including Scott Disick, Adriana Lima, Ghostemane, Salice Rose and more. He credits his passion and ability to constantly adapt to new technology and ways of thinking with his years at Moravian Academy. For more information on Carlos' work, visit his website at https://cjestudio.co/. This article appeared in the Winter 2019 Moravian Academy Journal's "After Moravian: Creative Paths" section on page 29.